Windows 8 where there are many features available for pc. Airplane mode and the metered connections are two of the major features available. These two options are newly added to network connections in Windows 8. 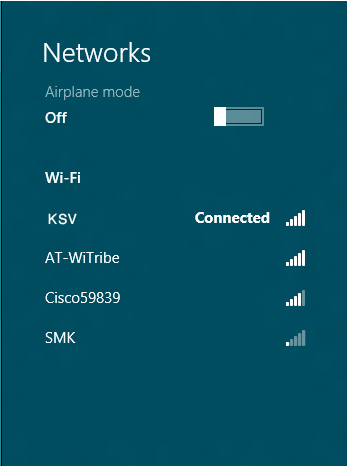 To access the Airplane mode, click on the network icon on the taskbar turn on Airplane Mode which is similar to the Airplane mode in mobile phones, which prevent any type of connections including Wi-Fi, cellular connections, calls etc. Your apps will still work, but won’t be able to connect to internet. The second option available in network settings is the Metered connection. If you are on a limited data plan or a 3G network where the data prices are high, you can set this network as metered connection. Just right click on the network and select the option. Setting this option will limit the downloads and uploads from Windows 8 there by reducing the data usage. You can also set Windows not to download any updates when on metered connection. 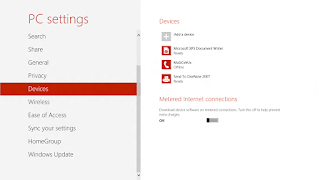 This menu can be accessed from Devices in the Start screen control panel. Step 1: Right-click on a open area of your desktop, then go to New and select Shortcut. Step 2: In the location box, type shutdown /p to shut down Windows 8 immediately or shutdown /r /t 0 to reboot Windows 8 immediately. Click Next to continue. Step 3: Type a name for your shortcut, then click the Finish button. Step 4: Right-click on the shortcut from your desktop and select Pin to Start. Step 5: Go back to the Start screen and verify that the new tile appears.